Reporters and Tokyo Electric Power Co workers look up the unit 4 reactor building during a media tour at TEPCO's Fukushima Dai-ichi nuclear plant in the town of Okuma, in Japan on June 12, 2013. Puddles with extremely high radiation levels have been found near water storage tanks at the crippled Fukushima nuclear plant, Japan's atomic regulator and operator said Monday, according to a report. Puddles with extremely high radiation levels have been found near water storage tanks at the crippled Fukushima nuclear plant, Japan's atomic regulator and operator said Monday, according to a report. The radiation level, measured around 50 centimetres (20 inches) above the toxic water, was about 100 millisieverts per hour, Kyodo news agency reported, citing the Tokyo Electric Power Co. (TEPCO). Around 120 litres is believed to have leaked out from a water storage tank. TEPCO denied that toxic water had flowed into the adjacent Pacific ocean, but the Nuclear Regulation Authority ordered the utility to study the possibility that it had escaped into the sea through nearby drains. The NRA released a preliminary assessment that the incident was a level one incident on an eight-point international scale, defined as an "anomaly". A low barrier around the tanks is meant to block water when a leak occurs, but drain valves may have been left open, allowing water to flow outside, the report said. A TEPCO employee found water leaking from a valve at about 9:50 am (0050 GMT) Monday. One of the puddles outside the barrier had an area of about three square metres and was one centimetre deep. 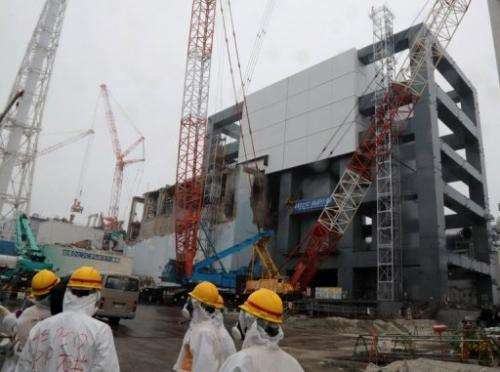 TEPCO has faced a growing catalogue of incidents at the plant including several leaks of radioactive water, more than two years after the worst nuclear disaster in a generation triggered by a huge quake and tsunami in March 2011. The company—which faces huge clean-up and compensation costs—has struggled with a massive amount of radioactive water accumulating as a result of continuing water injections to cool reactors. The embattled utility in July admitted for the first time that radioactive groundwater had been leaking outside the plant and this month started pumping it out to reduce leakage into the Pacific. While no one is officially recorded as having died as a direct result of the meltdowns at Fukushima, large areas around the plant had to be evacuated, with tens of thousands of people still unable to return to their homes.